Drawn symbols are probably the oldest way of preservation of information and wisdom, starting with depiction of life scenes in Stone Age caves, to trading seals with undecipherable scripts and to volumes of written text in the form of books. Somewhere in the evolution of writing from stone to paper, came inscriptions on palm leaves. 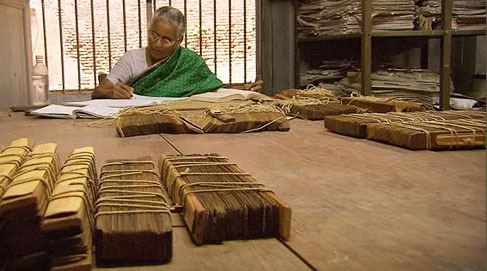 Even though palm leaf writing preceded paper, many collections of a few hundred years old palm leaf manuscripts survive to the present date, because they are much stronger and tensile than paper. Over 2000 years ago, Lipikaars, or scribes made hand written copies of sacred verses and ancient literature, under the patronage of kings and temple authorities. 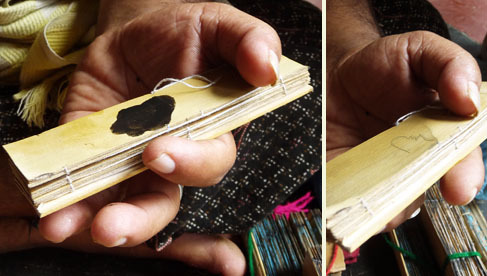 These precious palm leaf manuscripts would last a few centuries before new copies had to be made. Palm leaf painting may have begun with decoration of manuscripts with illustrative depictions of the stories or events, and took over to become an art form of its own. 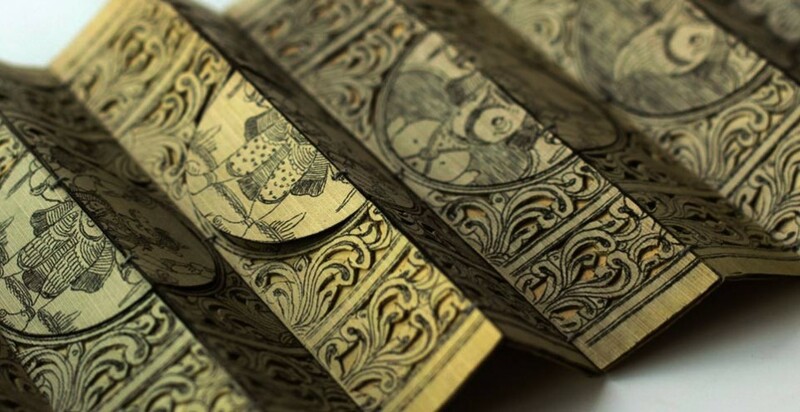 With engraving and use of colour, this art form evolved to bring a multitude of ideas, fables and tales to life. 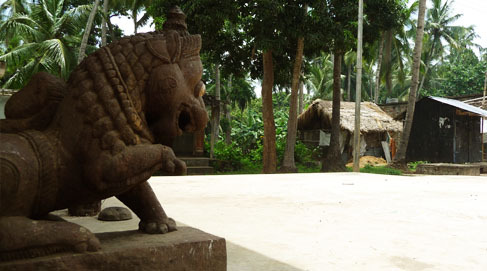 Orissa’s villages are the centres of the famous Pattachitra paintings, and in one such village, Raghurajpur, in Puri district of Orissa, creativity flows on any available surface, from cloth and paper to walls, terracotta and dried palm leaves. In the zigzag folds of crisp yellow-green leaves, delicately strung together with thread, are needle-sharp fine drawings carefully etched and cut out, telling stories from great mythological epics. 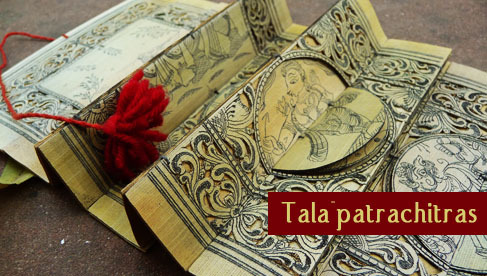 Known as Talapatrachitras, (tala – palm, patra – leaf, chitra – illustration) these palm leaf paintings hold a world of tales and secrets, beautifully depicted by the artists of Orissa. Palm leaves are first cut into the required sizes and treated with a solution ofturmeric, as the antibacterial properties of turmeric ensure longevity of the painting. Once dried for a few days, the leaves are ready for painting.Since the painting can only be done between the veins of the palm leaves, they are all more or less a standard size. Two layers are stuck together and a few of such strips are together with a thread, to create a scroll that compresses into a very compact block of zigzag folds. Sometimes the artists paint first and then stitch the strips together, such as when they want to insert colourful paper between the layers, to show through the fine cuts made in the illustrations. 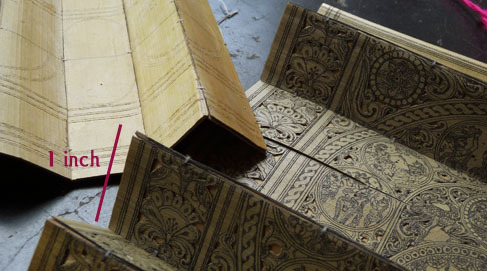 The painting on palm leaves is a unique process, as ink or pens are not directly used to apply colour. Instead, an iron stylus has to be used with extreme care, to etch the drawing on to the brittle surface, making sure that it doesn’t go wrong or the leaf doesn’t break. Once the drawing is inscribed,lamp black is rubbed all over the leaf and then it is cleaned, giving fine black colour to the carved lines, while rest of the surface stays clean. The artists also sometimes make very small cut outs in the painting, to give it a stencil like appearance. This requires a great deal of precision and skill, as the palm leaf is brittle and has directional grains, which interferes with a smooth usage of the cutting blade. Such beautifully placed cut outs make the painting even more intricate and lace like. Sometimes the artists use colour to beautify the painting, by inserting coloured paper between the layers or by painting with natural colours. Such developments have been quite recent compared to the ancientness of the art and have taken it to a new level. What makes this craft even more unique is that unlike many other handicrafts, which are struggling to maintain their age old standards of fineness, palm leaf paintings are evolving a higher quality of craftsmanship and aesthetic. 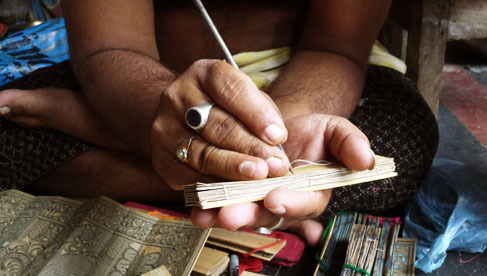 From an ancient method of documentation, the Talapatrachitra has become a treasured art, thriving under the growing skills of the master craftsmen of Orissa. Thank you for such a beautiful write-up. Learnt a lot from it. really great.we are looking only the collection of old and new manuscripts in one desk that is you only. thank you very much for priserve the old manuscripts.